Chisholm tall fescue pasture in early spring. The author is a plant breeder with The Samuel Roberts Noble Foundation, Ardmore, Okla.
One of the major goals of The Samuel Roberts Noble Foundation’s Forage Improvement Division has been the development of perennial cool-season forages, such as tall fescue, that could fill the “forage gap” from autumn through spring when bermudagrass is dormant in the Southern Great Plains. Chisholm tall fescue pasture in dormancy during summer. At first glance, this goal may seem narrow in focus, but systems producing forages throughout the year would limit the need for feeding hay and/or reduce the need to plant cool-season annuals, reducing production costs for producers. Once improved varieties are successfully created, their performance is analyzed through extensive evaluations, such as livestock grazing trials, to assess the economic impact and safety and to develop crop management practices that capitalize on the new cultivars’ value-added traits. Historically, the major forage species for fall and spring grazing in western Oklahoma, North Texas, and the Texas Panhandle have been limited to cool-season annuals such as wheat or cereal rye. For example, a typical management scenario for dual-purpose wheat involves planting in September, start grazing beginning in November or early December, and removing cattle in March at first hollow stem for grain production. 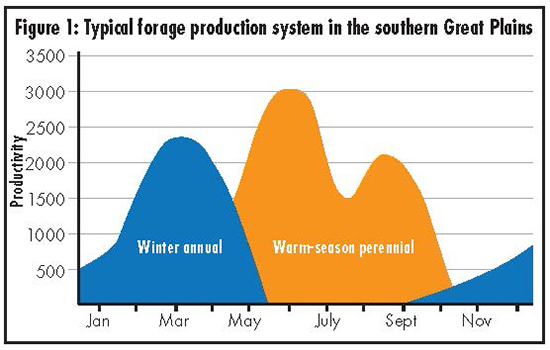 This management practice creates a forage gap between the months of March and May as well as September through November (see Figure 1). 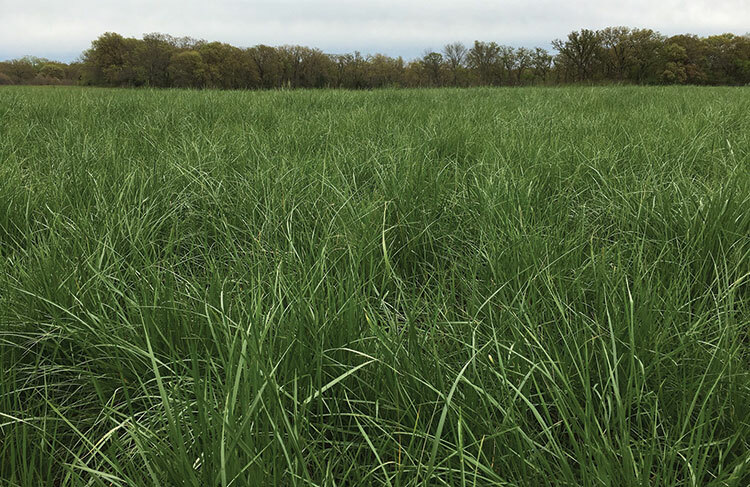 Tall fescue is a cool-season perennial forage that can provide valuable forage from fall through spring for grazing livestock. Tall fescue generally needs a minimum of 35 inches or more of annual rainfall for suitable production and persistence. Historically, this type of rainfall occurs east of Interstate 35 in Oklahoma and Texas creating a transition zone for tall fescue, which is adapted east of the highway but not to the west due to summer heat and drought. However, some tall fescue varieties possess a unique trait where the plant enters a period of dormancy to avoid the harsh conditions of summer only to be awakened by the cooler temperatures and shorter days of autumn. These tall fescue varieties originate from the Mediterranean region of southern Europe and North Africa and are often referred to as Mediterranean or summer-dormant types. 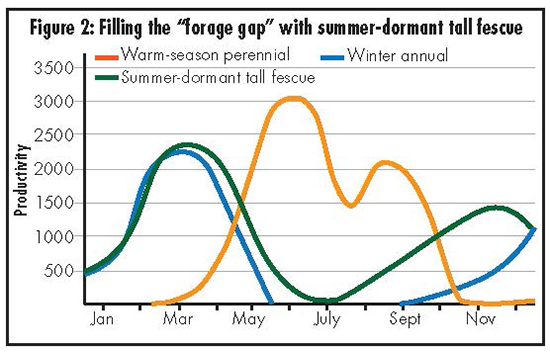 The majority of forage produced by these varieties is from autumn to spring, thus they fill the forage gap or reduce the need for planting winter annuals by producing high-quality winter feed for grazing livestock (see Figure 2). These summer-dormant fescues basically cease growth during summer in response to long days, high temperatures, and dry conditions. In western regions of Oklahoma and Texas, the Mediterranean summer-dormant fescues offer promise of cool-season production together with multiyear persistence. Currently, there is only one summer-dormant tall fescue commercially available to producers and that is Prosper, an endophyte-free cultivar. In contrast, the majority of tall fescue cultivars on the market today are classified as Continental or summer-active types. These types originated from northern Europe and are characterized by actively growing plants during summer. Consecutive periods of heat and drought can deplete these actively growing plants of resources, resulting in high mortality and stand loss over time. In Oklahoma and Texas, summer-active types are recommended only for areas east of Interstate 35 where adequate and more reliable rainfall is received. Common summer-active cultivars currently on the market today include Kentucky 31, Jesup MaxQ, and Texoma MaxQ II, the first tall fescue commercially released by the Noble Foundation in 2009. 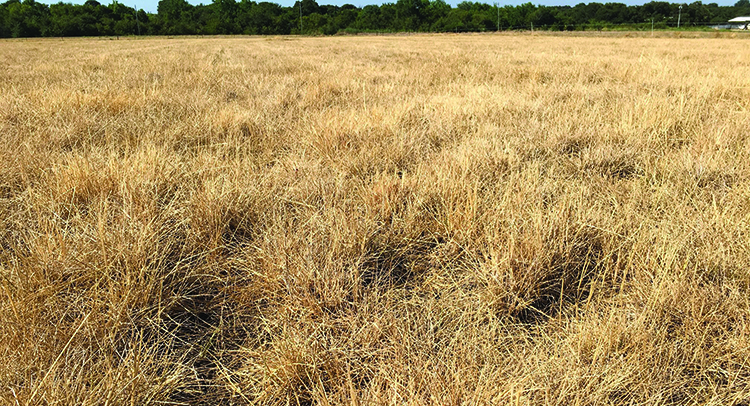 The Forage Improvement Division’s tall fescue breeding program aims to genetically improve both summer-dormant and summer-active types due to the Noble Foundation’s unique location along this transition zone of Interstate 35 in southern Oklahoma. In 2005, the Noble Foundation, Grasslanz Technology of New Zealand, and Gentos, a leading pasture seed company in Argentina, formed a collaboration with the primary aim of breeding summer-dormant tall fescue cultivars targeted for agricultural producers in the hot and dry summer environment of the Southern Great Plains and similar agricultural regions worldwide. The first cultivar to be developed and released from this collaborative effort is Chisholm. Chisholm is an endophyte-free tall fescue cultivar of Tunisian parentage with excellent persistence. It was developed to provide livestock producers with a persistent, perennial cool-season grazing option and is adapted to the hot, dry summer environment typical west of Interstate 35 in Oklahoma and Texas where summer-active types fail to survive. Chisholm is capable of producing high-quality pasture from autumn through spring suitable for grazing livestock before entering summer-dormancy; this fills the forage gap by reducing the need to feed hay and provides a perennial grazing option to complement or replace winter annual plantings. Chisholm tall fescue can be used in both tilled and no-till forage-based livestock production systems. Currently, Chisholm summer-dormant tall fescue is under commercial evaluation by Warner Brothers Seed Company located in Lawton, Okla. This article appeared in the January 2017 issue of Hay & Forage Grower on pages 10 and 11.